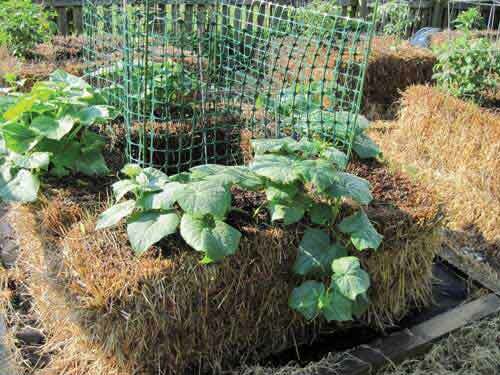 I’ve recently found an even better idea than straw bale gardening, and that is hay bale gardening! Straw bales are usually comprised of stalks of plants, mostly corn, that have been dried out and baled. Most straw bales consist of genetically modified plant matter, from corn or soy. It is definitely important to know the source. Adding Nitrogen, feeds the bacteria and fungi starting the decomposition process called “Conditioning your bale”. Due to the temperature rising any hay seeds would die, so not to sprout. Hay bales being made of grasses have the ability to convert sunlight and soil minerals into dense nutrition, whereas straw bales require fertilizer. Hay bales only need watering once a day vs multiple times a day for straw bales. It is really easy to find hay bales to get your garden started! It is also suggested that peeing on your bales is very beneficial, it is high in nitrogen and minerals. You can save up pee bottles for saving on fertilizer. See how to get one or a few started on the next page!